I love Halloween, when my kids where little I loved making them costumes, decorating the house with pumpkins, working in their classrooms on party day, doing Halloween crafts, going trick or treating and passing out candy. I loved it when they got back from trick or treating with rosy cheeks and pillowcases laden with candy and they sat in the middle of the living room floor and dumped it all out and started sorting and trading and they knew that Dad got the Peanut M & M's and Mom got the Almond Joys. When I buy my Halloween candy to pass out I still make sure the mix includes both! Even though my kids are all grown up, I still love all the cute Halloween costume ideas, crafts and fun food for kids on Pinterest (another reason I need grand kids!) 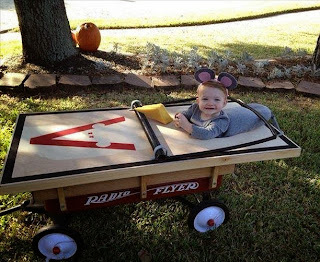 I still love to sit on my porch and pass out Halloween candy, and see all of the kids dressed in their costumes (the really little ones are my favorites). I usually make a crock pot of chili, and some pumpkin pie or cookies so we can eat a quick dinner and be ready for the trick-or-treaters to start coming by! My husband is a good sport, his job was always taking the kids trick or treating while I passed out candy but now that they are grown, Halloween really isn't all that exciting for him, I am sure he rather be sitting in his chair reading a good book, but he humors me and grabs a cup of coffee and sits with me on the porch :). There are many fun things to see and do this time of year and fun activities that families can enjoy doing together. My friend has taken her grandson to Skull Island Haunted Halloween for the last several years where kids and their parents are taken by boat to an Island in the middle of Pontiac Lake and are able to traverse haunted trails, visit dead man's cave, and play games with prizes. It also has a bonfire for parents to enjoy! Also many church's, schools and community centers offer activities and things for kids to participate in, like "trunk or treat" where kids can go from car to car in a safe environment to beg for candy. And for the older kids and teens there are always the many Haunted House's, Hayrides, and Corn Maze's. Whatever your age or your scare level is, it is a great time time to get outside and enjoy the fall weather, just check your local paper, the internet or your areas Chamber of Commerce for activities in your neighborhood! If you haven't figured out what you are going to be for Halloween, don't fret there are ton's of great ideas for easy costume ideas on the internet! I found this blog with 39 Last-Minute Costume Ideas, and there is always the stand by white sheet ghost! 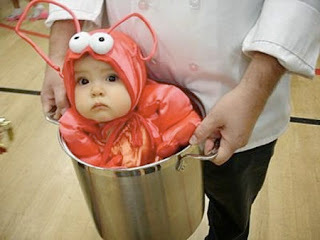 These little ones brought a smile to my face this year... how creative is the mouse trap and the lobster in the pot! 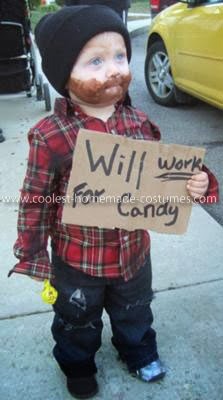 But one of my all time favorite simple costume is the homeless kid with the sign that says "will work for candy," I think I might try that one out this year and beg at a few houses in my neighborhood! If you are in our neck of the woods this Halloween night, make sure you stop by and say hello, we always have warm coffee, a bowl full of candy and good conversation! Whatever your plans are for Halloween this year... I hope you have a SPOOKTAKULAR time! These are cute and easy Christmas ornaments that are made using clear plastic bulbs, old sheet music or pages from books, glitter and Modpodge. They are sure to bring a smile to the music or book lover on your Christmas list this year! I had fun making them, and I can't wait to give them away! your fingers work great for this too but it is very messy! on the ornament lightly, then rub off with paper towel. but gold or silver would be beautiful too! These were very easy to make, and I think they would make great gifts for girlfriends, co-workers, secret Santa gifts, or gift exchanges. If you are looking for a fun craft to make for gifts this Christmas you should give these a try... no time, or not feeling like making a mess, just click on the tab at the top of this page, it will take you to my Etsy shop where you just might find a few already made ;), and don't worry it won't hurt my feelings if you tell them you made it yourself! Have I mentioned I like quick and easy. That is not to say I won't make more gourmet time consuming meals for special occasions but I believe every home chef needs a few basic go to recipes in her back pocket for quick week night dinners. 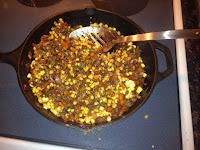 I like the concept of a skillet supper, it is kind of like "hamburger helper" without all the processed crap. You just cook it up in one pan, serve it with a vegetable or salad and you have a quick, nutritious meal for you family! This is a an easy one dish meal that you can whip up in a jiffy after a busy day. It's spicy flavor of cinnamon, blends well with the tomatoes, feta and spinach to make your taste buds explode! Directions: Cook ground beef and onion in large skillet on med/hi heat until meat is no longer pink, stirring occasionally. 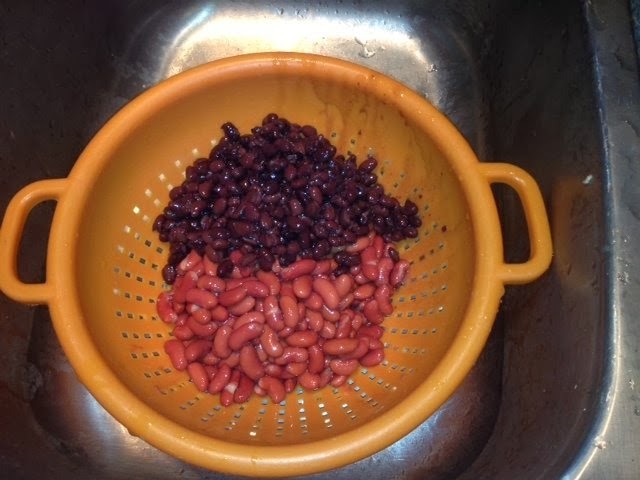 Drain fat from pan. 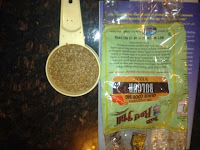 Add oregano, cinnamon and garlic powder and mix well. Stir in broth, tomatoes, tomato paste, and bring to a boil. Stir in pasta and reduce heat to medium. Cover and cook for about 10 minutes or until pasta is almost tender. Stir in spinach and 1/4 cup feta cheese. Cover and cook 5 minutes longer. Sprinkle with other 1/4 cup feta and let stand 5 minutes uncovered before serving. Enjoy! A healthy, hearty, vegan chili to warm you up on these chilly autumn days! I am not a Vegan, but I am interested in all kinds of healthy eating and lifestyles, and learning about new things. My friend, and neighbor Jane and her husband Dan have been eating Vegan for some time now. Jane is a 50 something ;) year old wife and mother who is in amazing shape. Jane is a true inspiration for us women who have crossed that big 50 line. She runs marathons, triathlons and has even competed in the Iron Man, she usually places top in her age groups for the races she runs in! 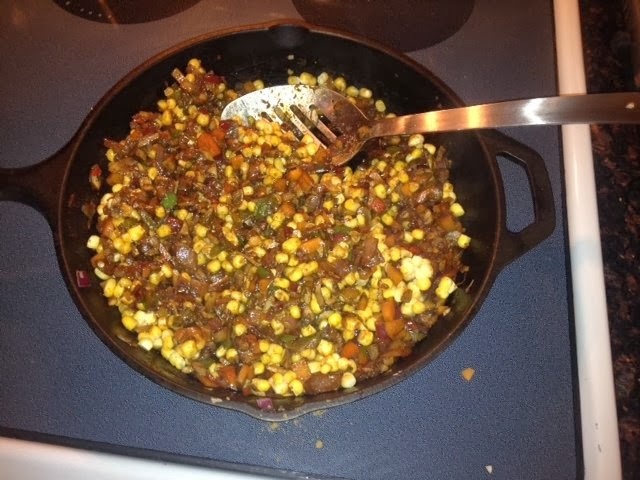 She recently shared a hearty vegan chili recipe that she makes. She also was kind enough to bring some down for John and I to try, and it was delicious! It has quick cooking bulgur wheat in it instead of meat, and a ton of vegetables too! The recipe is from Scott Jurek's book Eat & Run. Scott Jurek is an ultra runner who competed at a high level eating a vegan diet. If you are interested in reading more about Scott you can find his book at Amazon. Jane shared her copy with us, and my husband John is reading it now, and is really enjoying it. Directions: Add the oil to a large pot. Saute the vegetables and spices in the oil over medium to medium-low heat for 10 minutes or until tender. Add a few tablespoons of water if the veggies begin sticking to the pot. Add the remaining ingredients except the cilantro and simmer over medium-low heat, covered, for 30 minutes. Stir and simmer for an additional 20 to 30 minutes until the veggies are cooked through. Season with salt and, if more spice is desired, hot sauce or cayenne pepper to taste. Serve, sprinkled with the cilantro. Leftover chili freezes well. Makes 8-10 servings. 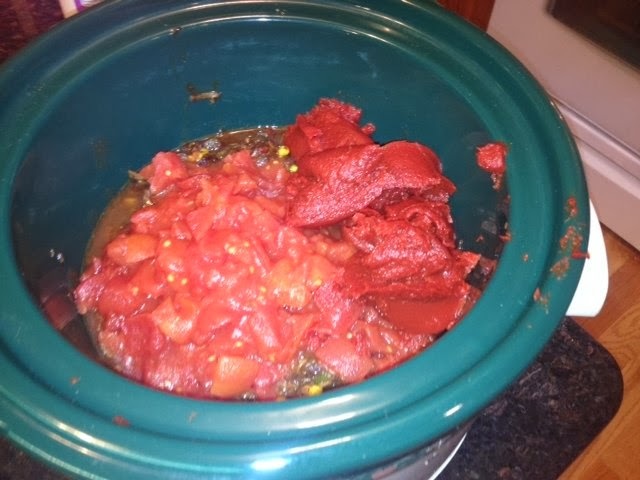 You can also just put all the ingredients in a crock pot (after sauteing the vegetables) like Jane did and cook on high for about 4 hours or low about 8! About 15 years ago I decided to make healthy changes to my life. I had some weight to loose. It was weight gained from pregnancies and my babies were now teens so it was time! I had more time for my own activities and started by playing some tennis. I pulled a calf muscle playing tennis and was told to strengthen my calf muscle by running. I reluctantly tried running because I wanted to continue to play tennis. I diligently stuck with running and before you know it I was enjoying it! Actually I was enjoying the way I felt. I had more energy and was losing weight. I was also eating healthy. Eventually the running took priority. I enjoyed running local races and improving. I made many new running friends. I was very inspired by a friend who is a very fast and efficient runner. She would race a half marathon and not even seem to be tired. She was eating a vegetarian diet. I also read the book Eat and Run by Scott Jurek. Scott Jurek is an elite ultra marathoner who won races eating a vegan diet. I decided one year ago to give a vegetarian diet a try.I was already eating very little red meat at that time so no meat was no problem for me and maybe it would help my running. I did some reading about vegetarians and found Forks Over Knives. I also watched the movie and bought the book. After a few months without meat, I decided to take dairy products out of my diet. I was learning about the farming procedures and the quality of meat and dairy products in our country. Dairy products are very high in fat and when you think about it cow's milk is really meant for calves not humans. I also feel sorry for the way animals are treated on many of our farms. So it is a plant based diet for me. My husband Dan also decided to make the change in January and has lost 70 pounds on a plant based diet. he exercised by walking and eventually jogging. I lost a few pounds and was running great. I ran the Toledo Marathon and qualified for Boston and then we both ran the Bayshore Half Marathon. We use soy milk or almond milk instead of co's milk. We eat lots of fruit and vegetables and whole unrefined foods. Variety is the key! the main things to avoid are Processed foods. Sometimes in place of meat we use tofu, tempe, bulgur weat or TVP. I like peanut butter and almond butter and nuts. One of our favorite meals is veggie pizza with double sauce and no cheese with salad and wine. We get enough protein. Sometimes we are led to believe we need more protein than we actually do. We have had doctor exams and blood tests and everything is in the normal range. My goal is to stay healthy and to not need any medications. 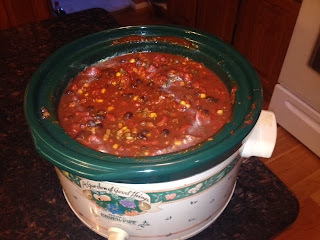 The winter chili recipe is from the Scott Jurek book, Eat & Run. Another helpful book and website we like is the No Meat Athlete. Jane's story is truly is an inspiration and I am so glad she shared it. She also works at Running Fit in Novi, so if you ever need a new pair of running shoes and aren't sure what to get, I am sure she would help you out! If you are interested in making this healthy chili for yourself you can get the recipe by simply clicking here for the Minnesota Winter Chili recipe. I don't promise you will run a marathon after you eat it, but your body will thank you and it might spur you on to try other vegan/vegetarian recipes! I was interested in learning more about the vegan lifestyle and what they eat and don't eat, if you are interested in learning more too, you can visit the Vegan Society website, it was a very helpful site that has lots of good information and recipes too. 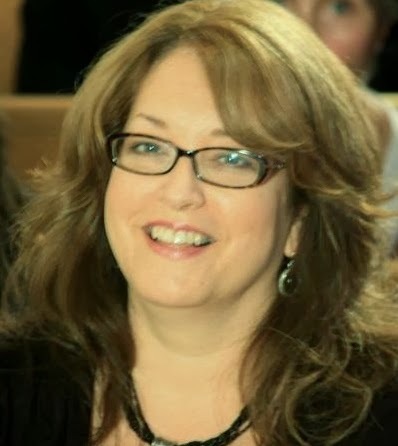 Thanks Jane for sharing your story with us, and inspiring us to live better, healthier lives! 2 points + per piece! This weight watcher friendly pumpkin pie french toast is to die for, and they are only 2 point + for each slice... served with reduced calorie maple syrup it is a great choice for a low cal breakfast! I like to make John breakfast on the weekends but I like to find things to make that are not going to blow the diet for the entire week! 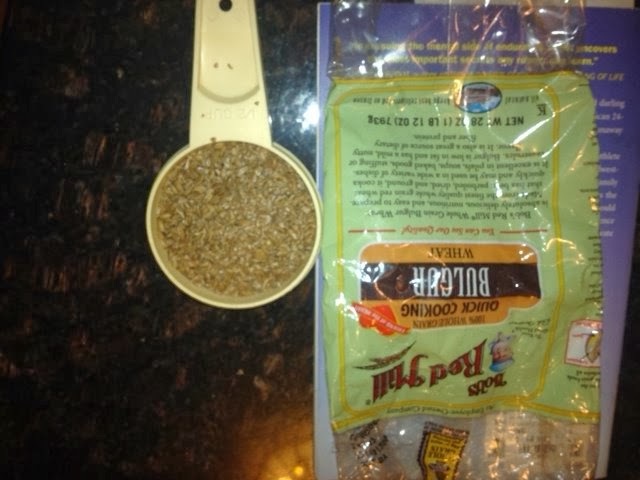 This low cal recipe is a great choice for a warm fall breakfast, especially if you are counting calories (or points). Directions: Mix ingredients and dip bread into egg/pumpkin batter. Cook on hot sprayed griddle until golden brown. Serve with reduced calorie maple syrup. Serve with reduced calorie syrup for a great low cal breakfast!